This year’s Catholic Identity Conference is now officially sold out, but we will be offering an “On-Demand CIC 2017” login and password that enables you to not miss a minute of this historic conference. Mass will be followed by the CIC 2017 introduction by Michael J. Matt and Eric Frankovitch, followed by the opening address delivered by our guest of honor—Bishop Athanasius Schneider. Q&A sessions will follow each talk. Saturday morning starts with the TLM, followed by a talk by Michael Matt on the history of The Remnant, to include 40-year-old video of the making of the old print-edition of The Remnant, as well as “catacomb” TLMs offered by the old “men in the black”—priests who never offered the New Mass. 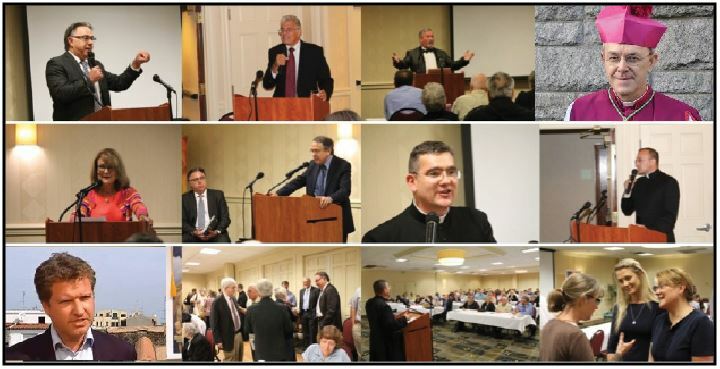 Saturday is an action-packed day featuring Vatican journalist Edward Pentin, the Roman Forum’s Dr. John Rao (look out, George Weigel), and addresses from priests from the SSPX, the FSSP and the ICK. Special interviews will be offered throughout the day for On-Demand subscribers ONLY! Saturday evening begins with a tribute to John Vennari, followed by an address from Bishop Anthony Spinosa on the myth of the “great” monotheistic religions. (Spoiler alert: there’s only one). The final talk be from our mystery guest—a diocesan priest who will talk on the Rosary and the Vatican’s terrible failure to call Christendom to prayer, before the entire Catholic Church becomes one big Hagia Sophia. The Conference will close with young traditional Catholics signing up for duty, followed by a Catholic action seminar hosted by all the speakers. For a one-time fee of just $20, On-Demand subscribers can have online access to the entire 3-day event (emceed by Remnant Editor, Michael J. Matt), to include all the talks as well as bonus features, interviews and special announcements not available anywhere else. The CIC 2017 On-Demand will not be available on YouTube but only at Remnant TV through a RemnantNewspaper.com pay portal. LIMITED OFFER. Click HERE to get your login and password, which are good for at least two months AFTER the conference. The CIC organizers managed to convince the Holiday Inn to add 20 more places for Saturday night’s banquet, which in turns allows us to offer 20 more tickets to the entire conference. Last-minute registrations will be taken on a first come/first serve basis. Register online HERE right now! This is also an incredible opportunity to support The Remnant financially in this our Fiftieth Anniversary year. All proceeds from the On-Demand CIC 2017 will go directly to support The Remnant newspaper and help to keep this website going. So enjoy the conference and support The Remnant by ordering your CIC 2017 login and password today.